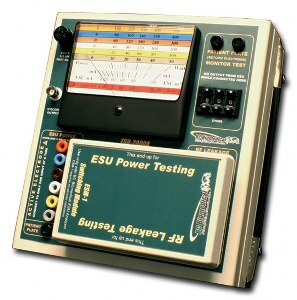 The model ESU-2000A is a precision Electrosurgery Unit Analyzer. It tests the RF power output of electrosurgery units. The power reading is taken from a large 4 ½ inch analog display. It offers six resistive loads for RF power testing from 50 to 500 ohms, along with a 200 ohm load for RF leakage current testing. The patient return electrode resistance simulation is adjustable in one ohm increments from 0 to 999 ohms.